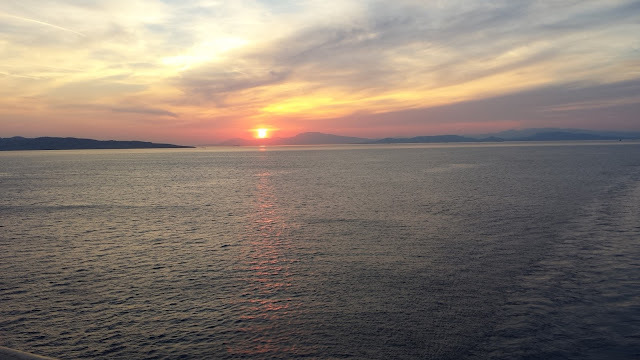 A few weeks ago, I started telling you all about our Mediterranean adventure to Greece and Turkey. 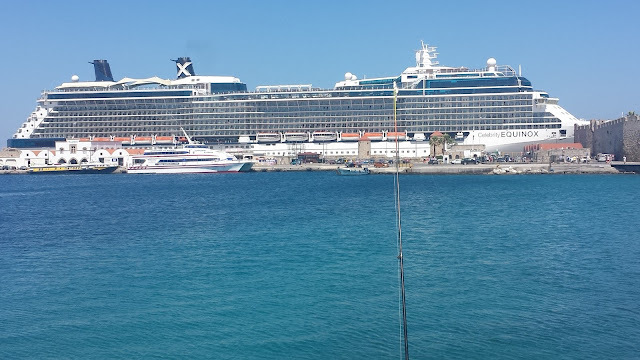 We started a day early in Athens and boarded the Celebrity Cruises: Equinox ship to begin our adventure. Did I mention that this was our first time on a cruise ship? AY CARAMBA!! We enjoyed this beautiful sunset as we left Athens behind and cruised towards the first of the Greek Isles, Rhodes. The view above is from the Ocean View cafe. Isn't it gorgeous and so romantic. I took tons of pictures like this every night so I could reminisce about those sunsets when I get back home. Although is nice, the dining experience at this cafe wasn't equally nice the first night. I was a bit disappointed in the buffet menu. The best dining experience was in the Silhouette restaurant where we had to make reservations every night. They had quite a selection of menu items to choose from and enjoy. I normally don't eat meat unless I'm out dining with my friends, so this was my chance to savor the Mediterranean cuisine. 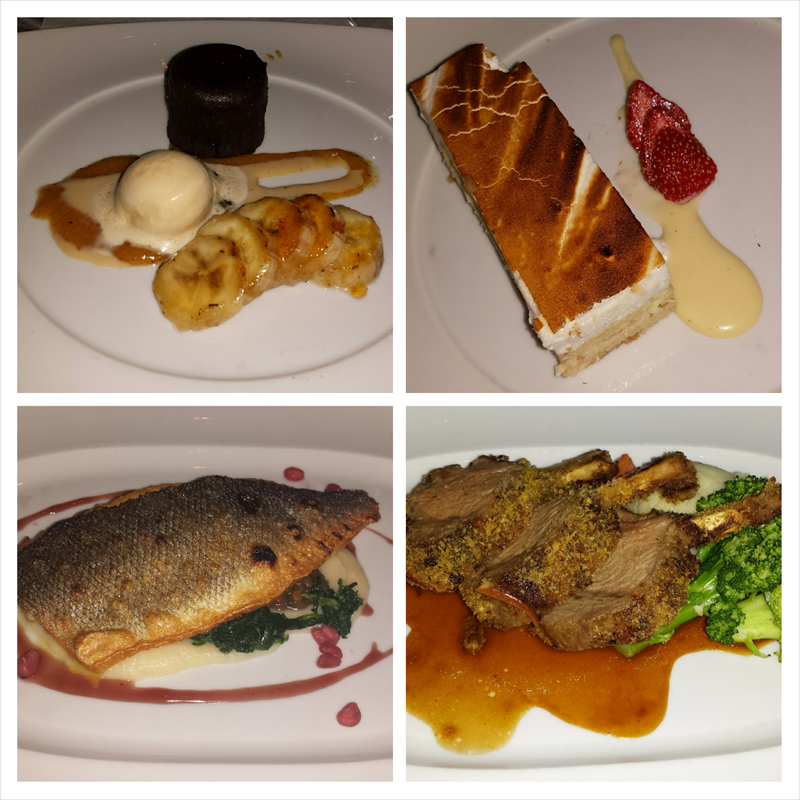 Each night I tried a different dish and really experimented with my palate. My parents loved the Mediterranean spring rolls, French onion soup, and the tomato bisque. We couldn't some of these items were served as appetizers; they were big enough to be entrees. We really had to control ourselves moving forward. Along with the food, we were really impressed with the quality of service at this restaurant. All the waitstaff were polite and helpful, I never felt like I was pressured to eat my food too quickly because they wanted to seat another family, If we didn't like something, they were all too eager to replace our food. It was unbelievable. - If you don't like anything on the preset menu, ask for the Indian menu which has a lot of vegetarian options. My parents ordered from this menu a couple times; here are some of their favorites: vegetable pakora, mixed vegetable curry, potato and beans curry, and yogurt. WE LOVE YOGURT. - If you have any allergies, let your wait staff know. They are very accommodating to their guests' needs. A Brother Like No Other!